I have been super busy working for my Uncle last week and taking care of the neighbor’s dogs. With Mom working Things seem to have gotten busier but they really haven’t. I am learning how easy if was for me to just go and do with no thought when she was home all the time. Now that is kind of biting me in the back side. So Monday, Tuesday and Friday I was gone all day to my Uncle’s. We worked some cattle and loaded and shipped others. Wednesday, I went with Mom to get her tile that didn’t happen. Then I spent the rest of the day roping. Thursday I honestly think I roped most of the day but I can’t remember … LOL … Maybe I am getting old! Then today I had a busy day too. First, I had to go pick up my trailer and bring home Mom’s boyfriend. His name is Bear. And he is her new longhorn Steer. He is gentle enough to get in the pen with but not hand feedable … YET! Mom is super excited and loves him already. And to top all this off somewhere in my truck there is a short. It keeps it from running and sometime from even starting. I have a guy coming to look at it but until then I am having to juggle borrowing Mom’s truck when she isn’t working. Yup it is fun times but I know that we will get everything lined out and back on track soon. What a wild week … Life is moving fast and things are changing. From the weather to my work week, this week has been a weird one. So Monday was the only day that I can say resembled our normal day. Mom worked and I worked horses. All the colts of our farm except Caballo are now riding around under saddle. Caballo is still getting the hang of the saddle and I haven’t mounted him yet. That is just because he isn’t really ready to take a human but he will get there. Tuesday I had to go get feed. Mom’s truck is still being worked on every weekend. And with Mom using it for her work, I have to borrow another friend’s truck to get things done so everything takes a bit longer. We have talked to the guys that will be putting the flat bed on my truck and if it keeps raining It could be done as early as this week. Things will get easier when I get it drive-able and tagged. By Wednesday Mom was off but I spent the day getting our horses rode so that I could take in two other outside horses. Streak was done and went home and now we have Fred and Conman. One is a four year old and the other is a six year old. I will be riding them for 30 days and then evaluating them before we decide what they need. On Thursday thing went bat Crazy. Mom went to work and I roped in the morning. 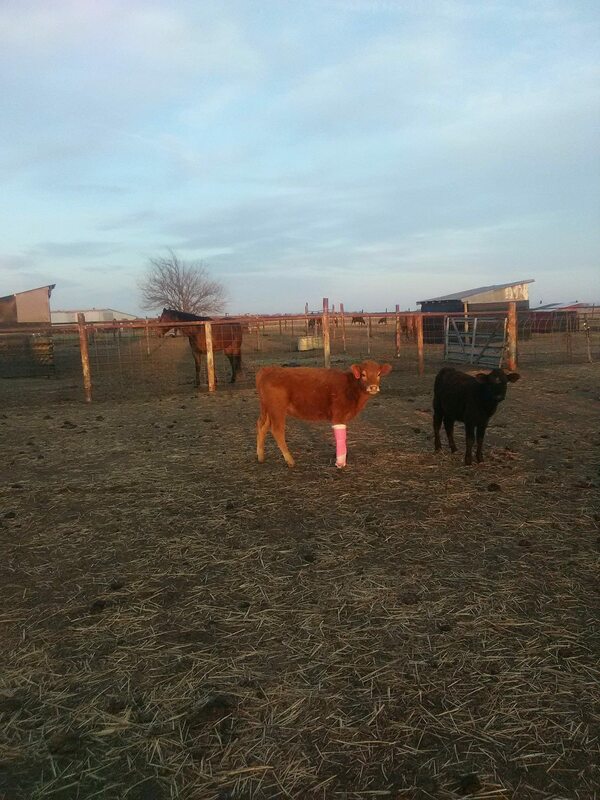 Sadly, some how while I was roping a Calf managed to break a leg. I called Mom and then I called for more help. Mom got casting stuff from the vet and a friend came and helped me cast it. Doc walked us through everything and the calf will be fine. In all my years roping this is the first time anything like this has ever happened. I roped her she spun around like normal and there was a snap and I don’t know after that. That afternoon I had to go work for my Uncle and that kept me busy and away from the house until late evening. Friday Mom worked again and I was doing chores for a friend while he was gone with his kids this weekend. Then I got called to help my Uncle again. That evening I headed out to a rodeo. I did win a pay check but in the end I earned ten bucks over what I had in the roping. So I guess I was only out my gas money … LOL Nope I couldn’t even break even this week with my roping, but hey … it could have been worse. Saturday it Rained and I thought that would get me a break but Friday when I was working for my Uncle, My Aunt got bucked off a colt. So I took over with him and I guess I impressed my Uncle as he asked me to come ride that colt again Saturday and check his cattle. That was no big deal. However, Mom and I had a Birthday party to attend in the middle of my working the horse. At that party I learned I was different. From my firm Handshake to the fact that I don’t have soft life and wake up sore some days … I learned other 20 year old guys don’t. It is okay though. I know who I am and where I am headed. I know I am level headed and trustworthy. I have integrity and a good heart. So I guess it is okay if I am weird. Today was suppose to be a family day. My Sister and her Hubby were coming for dinner and both Sis and Mom were cooking. Well, that changed when I found that Snow, the one Shetland I held from breeding, had given birth to this little charm We are now calling Rose … Short for Rose Quartz. I headed out to do my Friend’s chores. On the way home I found my Uncle’s Bulls were in the hay pen. They had tore down a fence and done some damage. I called to find that he was out of town and that the guy he had working for him still hadn’t been there leaving all the horses unfed as well. So after a phone call, text and such, I found myself fixing panels, feeding horses and working cattle while waiting for a pot load of cattle to come in for him. I was gone all day again today with an unplanned agenda but on the up side when I got home I found my family waiting with some good food and laughs for an awesome dinner. So thing went a little crazy for a few days. On Thursday I took a calf to the vet for a friend, Dad brought home a new little guy and the neighbor burnt up the phone lines, Friday Meringue had twins, Saturday and Sunday I went to a roping, Ride for World Health came by for a visit today, and the Truck is in the shop AGAIN. So Thursday Mom worked and I was suppose to have some time just for myself. I was thinking I would clean my room. Good thing a Friend called and needed me to go take a calf to the vet. I spent time doing a bit of running for them and when I got home Dad was headed home with a new addition to the goat herd. This is Richard. His owner just needed him gone so he is now in quarantine for 10 days to join our small herd. At some point Thursday I realized the internet wasn’t working. So I called the phone company and found out that when our Neighbor burned off her pasture she also burned up our phone lines. It took two days to get it all up and running again. Friday It was back to business with Meringue giving birth to twins that we are calling Ametrine and Moldavite. And you know me I am calling them Amie and Moldie. Saturday was my busy day. I started by dropping off the truck at the mechanic’s again. Then I left at 10am to go work a team roping. While I was gone Mom spent the morning teaching and demoing Spinning at a local community room. After my team roping was over I headed south to a rodeo where I spent most of the night. I team roped and calf roped but was up in the slack so I didn’t rope until 1am. That made it almost 4am when I got to bed. Then today it was pretty much more of the same. I left about 10am and this time I worked the team roping and took part in it. When I got home I had to return the truck I had borrowed since we can’t pick up Mom’s until tomorrow after she gets off work. 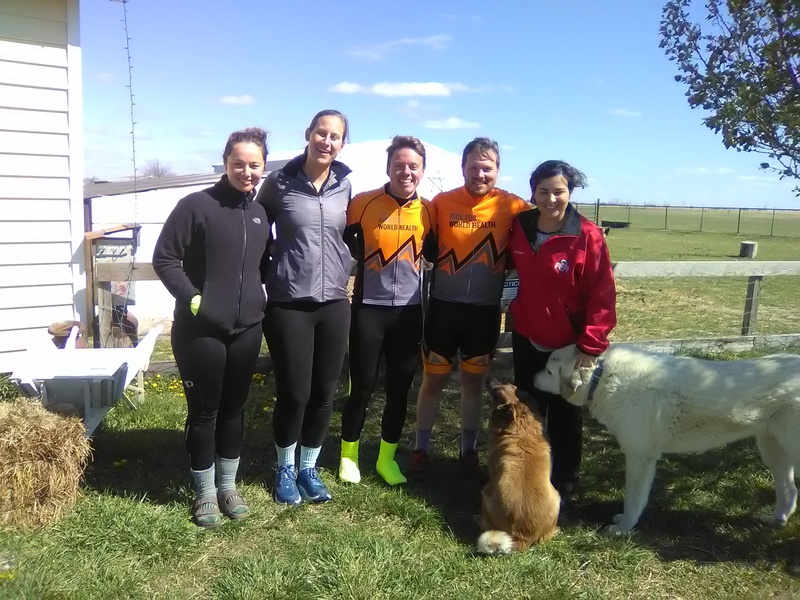 While I was gone today Ride for World Health Made their annual stop at the farm. Please keep this 6 person team in your thoughts and prayers as they fight cold head winds to get back to Ohio for Graduation and then heading on to the east coast. So this morning I got up to find Sister moving the kittens again. The funny part was the as Sister moved the kittens out Fatso moved them back. So there was a back and forth traveling kitten exchange that I helped Fatso get a head of. She was slower then Sister so I moved a couple at a time to get her ahead of the game. After about 2 hours Sister finally gave up and Fatso won the kitten war. While I dealt with that Mom had to leave to go get things done in town. The first assignment for her was to see the Tax man. He did the taxes and Mom and Dad are super excited that they don’t own anything for Either Federal or State Taxes. From there she dropped of some prizes for Senior Day and ran to the post office before hitting the grocery store and heading home. On her way home she stopped to put up a neighbor’s calf. That left me to handle Sally and her baby. (Okay maybe she didn’t even know it was being born when she was getting the calf off the highway) When I thought that Sally was all done I headed to the house to have lunch with Mom. After lunch we got word that we had some visitors on the way so I took time to get Streak rode. When the Guests arrive it was a good thing that they were not first time visitors and that Mom and one of them are looking at starting a Fiber Craft night at a local Non-profit. I say that because as Mom came out to show off the new baby … Sally had twins that we decided to name Crystal and Petalite. And then another Ewe spit another one out. She hollered for me and I got towels to help dry them off. The sun was shining so we used it to warm them up. Mom worked with Sally’s second baby and I took on Corlette’s new addition that we named Sunstone. After all that was said and done, I headed to my roping partner’s house to get in some practice. Mom stayed at the farm, got babies into the barn and pens set up for them. After that she did a walk around. Then I got a call from Mom. She wasn’t happy and I can say that I am not sure I am real happy either. You see Mom found that Snow has a bag. That means she is bred. We didn’t want her or Reba bred and it looks as if we didn’t do a very good job at keeping that from happening. Now we will have to keep a good eye on her as we don’t know WHO the Daddy is. In the end that also means we only have three ewes to lamb out and we will be done until fall. Cinder, Meringue and SNOW! Things have gotten a bit crazy around here … and it is a good thing. The last few days have been full of farm visits and Event Planning. Throw in a few lamb births and some more kitten with a touch of horse shoeing and a dash of Roping and you have my week in a nutshell. So Thursday I spent the day with Farm visits and the horse shoer. The first visit was a large one with a nice lady that brought her grand kids to see the animals up close. I think they all had fun. At least I Hope they all had fun. As they were getting to the end of their visit Rocky the Horseshoer showed up. He trimmed and shoed everyone while I had another visit show up. They were a smaller visit but a repeat so I was less nervous. In the end I think I did okay. I have room for improvement but I don’t think I did to bad. Friday was full of Cleaning and running to get the last of the event stuff done. Mom had the day off so she was with me as we finished up everything. The barn was clean and the porta potty delivered. In town things were printed and center inventory increased. As well as lunch for the volunteers gathered. When we got home we finished up setting up the tables. Then is when we found out that we had a water leak. So we put everything on hold and ran to town and got the stuf to repair it. Then we got back home and got it all fixed. Saturday Morning we got up ready to get a few last things done around the house that Mom wanted done. First Mom and I Podcast. Then it was suppose to be Dishes, floors swept … ECT … However like Friday night, that didn’t go as planned either. Yang, the kitten we now call Fatso, decided it was time to pop out some kittens. It was funny because she would hiss at me but she would grab Mom’s hand every contraction. As the event started we left the house with two kittens born and cleaned. By lunch when we returned for Lunch there was three. We ate sandwiches, potato chips and Potato Salad. In the end she too had four kittens. Since it was cold we weren’t swamped as in years past so Mom let me take off and head to a roping. I roped clean but my calf kicked so I was a bit slow and one out of the money. I did get home about 9 and when I went to do chores I found that Biscotti had decided that she was tired of being pregnant. So she went ahead and shared her new little girl with the world. That we named Bixbite … I am going to call her Bixby for short. We all headed to bed but Mom was up and down with Ying and Yang most of the night. We had given each Momma her own space with her own kittens. Each Kennel had a pillow, a blanket and a heating pad. To bad both Momma didn’t think it was good enough. They swapped kittens and kennels so many times last night and Sister even hid Fatso’s kittens. Okay, three kittens and then stole the other one. It was a mess. This morning I was awoke to Mom about in tears asking me to help her find them yet again … It was funny but not to Mom. She was so tired but I got up and found them all and then we decided to put both Mommas and all the kittens in one bed. Finally we had a successful solution. No longer do we worry about who is feeding kittens but only that they are getting fed. There is now peace in the nursery. As for me today I am headed to a team roping. I am not only roping in it but I am working it. That means I may not be home until later so I will let you know how I did in another post. 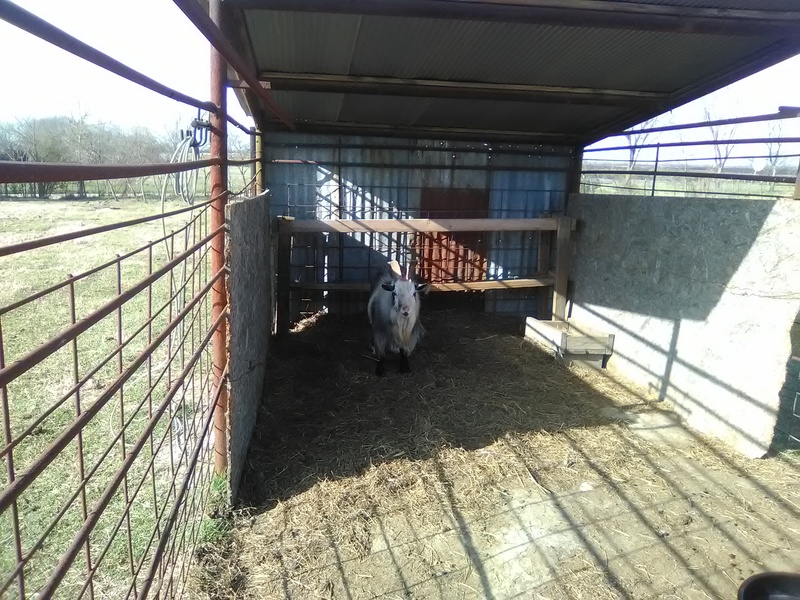 Check out our wonderful Score … New to us Petting Farm Pens … And we got them from Free. Today was a cold one. 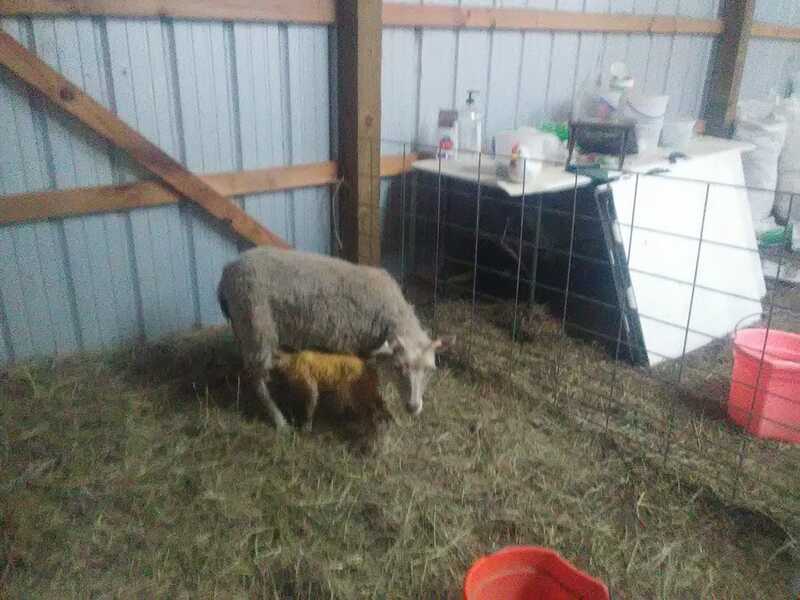 It started at 3 AM again with Petunia giving birth to a Ewe lamb. It was also a day of Chores, roping, more babies and truck repairs. I guess it was a good thing that it was only cold in the morning because most of the “good stuff” happened in the after noon. 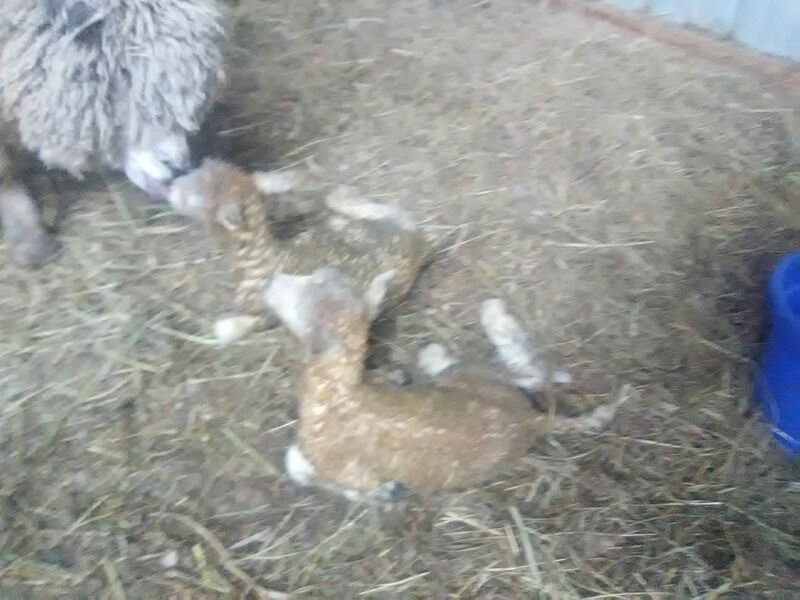 Mom and I got up at the 3 AM lamb check to find that Petunia had given birth. It was super cold and windy so it took us a bit to get them both in the barn and settled in. Mom fed Petunia Cookies while I hooked up the light for the little girl that we have decided will be called Sapphire. When I got back up at 7 AM I started my regular day chores. Then I took time to eat something while I waited for it to warm up. After that I worked on my list of things to get done for the day. I cleaned part of the barn we need for Saturday, Put up some signs and then I cleaned up the roping center. By this time Pistol decided she wouldn’t be out done by Petunia so she went into labor and gave us twins. One girl and one boy. We have decided to name them Tanzanite and Turquoise … I think I will call them Tanzy and Turkey. After that the weather turned nice and I decided I deserved some time in the roping arena. By the time I got done Mom got home and her truck was making a funny noise. She said the front end was pulling like she had a flat but she didn’t. I got to looking and found that the Stabilizer link on the driver’s side front tire was not stabilizing anything as the Bushing had busted into several pieces. I am super happy that it didn’t break while I was hauling a horse anywhere. So I took the old one off and headed to town and got a new one and got it put on in no time. I even took the time to check the other side so that we are sure it won’t happen again.